How to grow in Frontier Markets? Frontier Markets and the future of their growth are being questioned in today’s global economic climate. The anemic global trade rate, and the rapid depreciation of world commodity prices has lead to many key questions being asked about Frontier Markets. Hafezi Capital International Consulting was invited to attend the FT Frontier Markets Summit held last Fall in New York City. Some of the key questions that were being asked by Business Leaders was how can Frontier Markets continue to grow in the coming years with commodity prices depreciating? Have Frontier Markets taken on too much debt? Is growth a future prospect? How has the U.S. Federal Reserve Policy affected investments in Frontier Markets? 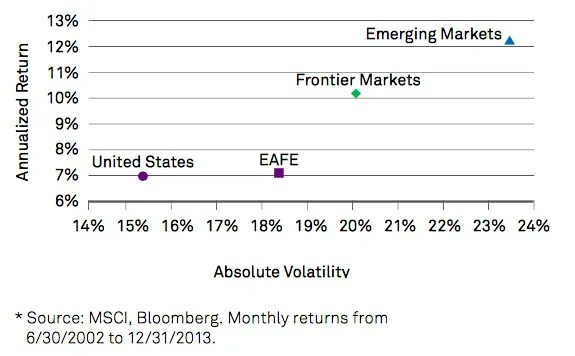 When we look at the data emerging from Frontier Markets, we can see that overall internal data remains positive. Countries such as Mongolia, that have had a China dependency (China correlation rate of 86%), have faired worse than countries that are less dependent on one single economy. Countries such as Kazakhstan went from a 7.5% GDP in 2010 to a 6.0% GDP in 2013. The Gross National Income (GNI) in Kazakhstan is $11,550 versus that of Mongolia which is $3,370. Comparing Frontier Markets we see that even in countries like The Kingdom of Saudi Arabia, where oil prices have depreciated by nearly 50%, are growing and remain healthy. Saudi Arabia’s (GNI) is $26,260, over double that of Kazakhstan, with a Gross National Product that is 300% larger than that of Kazakhstan. Frontier Markets should be viewed on a country by country basis and not combined in a basket as a whole. Each country has its own economic and social-political intricacies that drive development and growth, and thus require a set of strategies that are unique to that country. Focusing on the correct country and developing a specific market entry strategy will allow organizations to maximize their Frontier Market endeavors, while minimizing costs. Why should we enter Frontier Markets? Frontier Markets present the biggest and most opportunistic investment for developed corporations. They generally have a growth rate that far supersedes those of developed markets and generally present a lower number of competitors. Companies that enter at the right time within Frontier Market can lead the industry, compete on pricing and define the future demands of the population. Frontier Markets should be looked at like Swiss cheese, by their nature they lack the governmental structures (the holes), and thus organizations that can develop models that create efficiencies and provide better quality products to its citizens will become key participants within their internal economy. Frontier Markets today have less barriers to entry than 30 years ago. As an example, the Federal Government within Mongolia has a maximum of 14 days to approve plans for development projects in major cities such as Ullanbaatar. In the United States this process can take months or quarters based on the county and the specific project. Frontier Markets understand that to be competitive they must decrease the bureaucracy, and thus the central governments have become competitive in the past decade. The future of growth is within Emerging and Frontier Markets, given the regional demographics, pent up demand and the demographic advantage. The decade long commodity super cycle has made Frontier Markets exceptionally rich. Many of its citizens have become global consumers of products and service. The trends and growth for luxury products have moved to emerging and frontier markets, from established markets. Whereas Prada has closed flagship boutiques in Japan, it has opened stores at a record pace in China, Thailand, and Mexico. With developed world financial parity, the Frontier Market consumer expects global quality products and services. The Global Citizen requires global quality and luxuries and thus the internal demand for developed markets brads. Frontier Markets are generally younger, lack individual debt, and are more entrepreneurial than developed markets. They generally purchase everything in cash, with leverage only being utilized when necessary. Credit Card and Auto debt is nonexistent. Debt is solely undertaken for purchasing real tangible assets such as a house or investing in a commercial or corporate acquisition. Frontier Markets present the perfect opportunity for established companies to grow in new markets. However, when we think of these markets we have to understand that many lack the proper infrastructure to make them functional in par with Developed Markets. However, hyper growth can come from companies that provide the key infrastructures that are missing. A great example of this is Vodafone’s M-Pesa a money transfer system that uses PIN based SMS technology developed by Vodafone for two initial markets Kenya and Tanzania. M-Pesa launched in 2007 and by 2012 it was considered the most successful and popular application in the world with over 17 million M-Pesa accounts in Kenya and 7 million M-Pesa accounts in Tanzania. M-Pesa became larger than the banking system and redefined who is bankable in Emerging Markets. M-Pesa has become the largest Bank in in assets holding in Kenya and services over 30 million customers in over ten markets. Frontier Markets present less competition, and present long term opportunities for growth and product offering. However, when entering Frontier Markets we must understand that the return on investment may be a longer cycle than developed markets. Emerging Markets should not be seen as a sprint, but rather a marathon that can yield ultra high returns for decades to come.